We all need rest. Rest allows us to refresh, to replenish, to be ready for the next challenge that is ahead. Whether it be a sports team that takes a break between heats or innings or periods in the game, or a person working hard at their job throughout the day, we all need rest. God set the example for us when He rested on the seventh day of creation. And He wasn’t even tired! 30 The apostles gathered around Jesus and reported to Him all that they had done and taught. 31 He said to them, “Come away by yourselves to a remote place and rest for a while.” For many people were coming and going, and they did not even have time to eat. 32 So they went away in the boat by themselves to a remote place, 33 but many saw them leaving and recognized them. People ran there by land from all the towns and arrived ahead of them. 34 So as He stepped ashore, He saw a huge crowd and had compassion on them, because they were like sheep without a shepherd. Then He began to teach them many things. 39 Then He instructed them to have all the people sit down in groups on the green grass.40 So they sat down in ranks of hundreds and fifties. 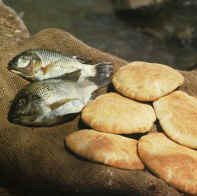 41 Then He took the five loaves and the two fish, and looking up to heaven, He blessed and broke the loaves. He kept giving them to His disciples to set before the people. He also divided the two fish among them all. 42 Everyone ate and was filled. 43Then they picked up 12 baskets full of pieces of bread and fish. 44 Now those who ate the loaves were 5,000 men. 30 The apostles then rendezvoused with Jesus and reported on all that they had done and taught. 31 Jesus said, “Come off by yourselves; let’s take a break and get a little rest.” For there was constant coming and going. They didn’t even have time to eat. 32 So they got in the boat and went off to a remote place by themselves. 33Someone saw them going and the word got around. From the surrounding towns people went out on foot, running, and got there ahead of them. 34 When Jesus arrived, he saw this huge crowd. At the sight of them, his heart broke—like sheep with no shepherd they were. He went right to work teaching them. That didn’t take long. “Five,” they said, “plus two fish.” 39 Jesus got them all to sit down in groups of fifty or a hundred—they looked like a patchwork quilt of wildflowers spread out on the green grass! 40 41 He took the five loaves and two fish, lifted his face to heaven in prayer, blessed, broke, and gave the bread to the disciples, and the disciples in turn gave it to the people. He did the same with the fish. 42 They all ate their fill. 43 The disciples gathered twelve baskets of leftovers. 44 More than five thousand were at the supper. The disciples thought they were getting a break (v 31), but they ended up serving. What does this passage say to you about the use of your free time? How can you use your free time this week in a God-pleasing way?